Haircut on the beach at low tide. Penguins halt and move on. Ship is not coming; ice blocks their passage beyond our safe haven. Grey water rippling. Penguins are all crashed out from their nocturnal swims. Tudor observed them at 2:45am, gathering by the water’s edge, quorate around one hundred, they launched off before the next group assembled (in ten minutes) and again they are away, diving and feeding for twelve – eighteen hours. When they come back, propelling up and out of the sea, they preen and shake before returning to the nesting sites. Dare the Stairway to heaven with Helen; it’s steep and the last step is ginormous. When will I brave it alone? Shovel snow from deck and swing into it, heaving and tossing high over the bank, hopefully avoiding ramp and gentoos around the flagpole. Helen is on the opposite side, hacking at ice with a pick. Hot work. During tea break, I discover that my hairdressing appointment is at midday. Vidal Baboon has had a cancellation. Boil up water and scald head in a bucket. The salon is a chair, set on the beach at low tide. Walk down with wet conditioned hair (which freezes into attractive dandruff.) Helen takes documentary shots and issues encouragement. Vidal’s fingers are sporadically immobilised by the frosty nip, so he has to pause and blow on them. Passing penguins halt and move on. Twenty minutes later, the deed is done; I’m shorn. Retreat to bunkroom and whack on heat. Tomato sauce soup for lunch, followed by a game of liar dice. Go down to the ice sculpture garden as we’re out of water. There’s a second adelie… but they don’t appear to be talking to each other (only ten metres apart.) The blue ice shapes are magnificent, multi-hued, multi-textured. Gazing into the shallows I see a crustacean, which looks interesting. 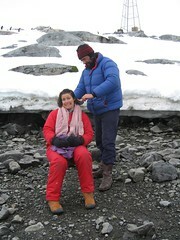 Helen removes boots and socks, rolls up thermals, steps straight in and plucks the creature out! It’s a poorly isopod, more used to deeper waters. Helen, lying down, discovers a constellation of bright starfish. Rick’s still running errands, fixing aerials – we call him over and he joins the Helen Annan Nature Walk. We see sea urchins, snow-snakes (pinky/purple squiggles) sea fleas, shrimpy things, multi-millipedes, lots of limpets and orange woolly anemones. Much adventure en route, rock climbing, iceberg surfing, (Tudor) snow caving, (Rick) and pausing to watch penguins, catching new angles and perspectives of our little island. Think a lot about St. Agnes on the Isles of Scilly (rounded rocks) and ‘The Summer Book’ by Tove Jansson (island as microcosm.) The final section of circumnavigation looks too hard-core for me, so I reverse up the Stairway to Heaven and plod in Rick’s footsteps instead. Essential tea time! At several points this afternoon, the others have stared askance at me, mistaking new haircut for a new person altogether. Can’t resist a pee amongst marooned icebergs, watching gentoos dripping gold in this evening light as they porpoise. While Tudor prepares mystery feast, the remainder go through the motions of a yoga session, warming up slowly and groaning at our stiff shoulders. The Mexican dinner with the same diminishing resources is excellent. Chilli con carne, refried beans, strips of stir-fried pork and tortilla chips. Extraordinary. Mini slide show of recent photos from me and Helen. Another day in icy paradise.